Lindsey Stirling; is she Dating after Breaking up with Boyfriend Ryan Weed? 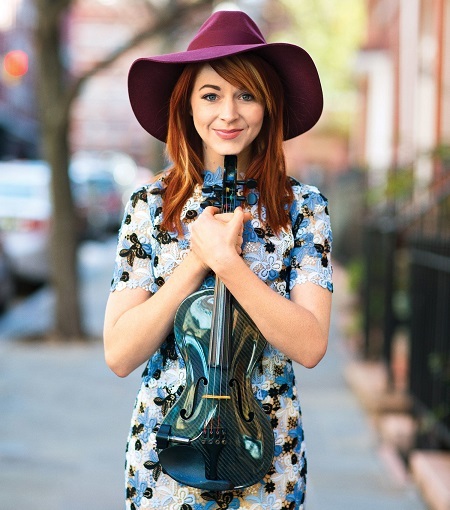 Know all about you want to about Lindsey Stirling, is she dating anyone or is still single?? Get notified with her affairs and relationships. show 'Dancing With The Stars' season 25 with choreographer Mark Ballas. The professional violinist has surely amazed us with her dancing skills. Today, however, we are here to discuss the dating life of Lindsey. Is the diva dating someone? Who is her boyfriend? We have all the answers. Lindsey and her dancing partner Mark Ballas are leaving no chance to impress us with their dancing skills but apart from that people are also noticing their amazing chemistry and speculating their relationship. So, are they really dating each other? Well, sorry guys!!! but it's a wrong guess!! Stirling is reported to be single and is focused on her career. We all know about her recent heartbreaking split with her boyfriend, Ryan Weed and seems like she is still not ready to have someone in life. Ryan works in the independent fragrance house, Carlston, Co. in LA. Here is a video of Stirling talking about her break up with Ryan. Lindsey, however, has proved herself strong enough to overcome the grief of heartbreak and is focused to fulfill her dream and no any evidence of Lindsey dating someone has been found these days. Lindsey and Ryan were in a relationship for more than one and a half year before their split. The couple started dating in summer 2016 as in late June 2017, Linsdey shared her tweet as a sweet tribute to Ryan on their first dating anniversary. "I wanted to have a family and I thought I was ready to go to the next phase but... I am really grateful to this show as I have got something to love." It's not that Lindsey has not experienced the love before. Prior to Ryan, she was in the relationship with videographer Devin Graham. But all of sudden the relationship came to an end as they decided to separate after 1-year relation in 2013 without any reason disclosed. Was born on September 21, 1986. Went to Mesquite High School and joined four friends in a rock band called Stomp on Melvin. Her autobiography "The Only Pirate at the Party" was listed at number 10 on The New York Times hardcover nonfiction best-seller list for January 31, 2016. She overcame her eating disorder anorexia. Stirling teamed with the non-profit Atlanta Music Project to help spread appreciation of music to children on October 1, 2013.